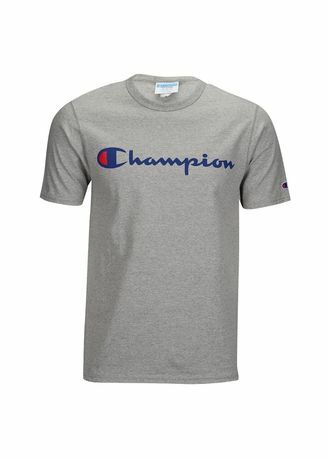 Get durable, long-lasting style with the Champion Graphic Short Sleeve T-Shirt. The set-in, mini-ribbed crewneck offers a comfortable, nonrestrictive fit, and holds its shape wash after wash. Shoulder-to-shoulder taping prevents this shirt from getting stretched out, and double-stitching reinforces the sleeves and hem. Features the classic Champion script logo and a “C” patch on the sleeve. Athletic fit offers greater mobility. Tagless for a comfortable fit. Solids: 100% cotton, Oxford Grey: 90% cotton/10% polyester.